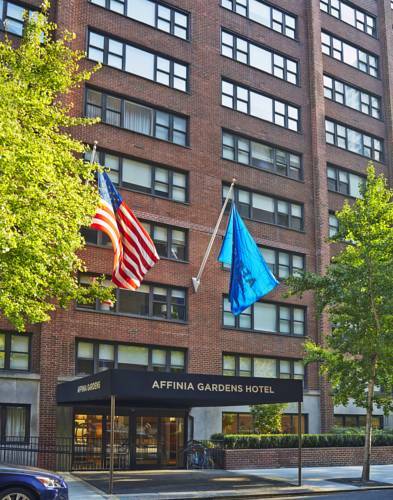 Gardens NYC- a haven of serenity and style is located in the heart of Manhattans Upper East Side neighborhood. A tranquil retreat to make you feel right at home in NYC this boutique hotel on the Upper East Side offers ideal NYC hotel amenities and services for comfort and tranquility such as The Cupboard and our VIPaws Pet Program. Our Upper East Side hotel offers 129 generously appointed suites with open living space and full kitchens ideal for extended stays in Manhattan. Our signature Affinia bed is made even more inviting with your choice of pillows. Large vanities with Hollywood-style mirrors create a homey environment. For an exceptionally peaceful stay ask about our first-floor Private Garden Terrace Suites or Terrace Suites offering coveted private outdoor space in the middle of Manhattan. Located on the Upper East Side of Manhattan on East 64th St between 2nd and 3rd avenues. Just a few blocks away from Central Park and 5th Avenue shopping.